Heat oven to 350 F. Bring a pot of water to boil. Boil shells according to package directions. Meanwhile, in a medium bowl, combine cottage cheese, cream cheese, parsley, basil, rosemary, tarragon and egg; stir well to fully combine. Season with salt and pepper. Fold in shredded chicken and 1 cup of mozzarella cheese. Set mixture aside. To make the alfredo sauce: Melt butter in a medium saucepan over medium heat. Add garlic and cook for 1 minute. Add heavy cream and milk and stir to combine. Bring to a simmer and cook for 10 minutes, until mixture begins to thicken. Season with salt and pepper; add Parmesan cheese, stirring well to combine. Let cook over medium heat for another 4-5 minutes. To assemble: Spread 1 cup of the alfredo sauce over bottom of a 9x13 pan. Stuff each shell with chicken mixture, filling generously and lining up the shells in the pan. 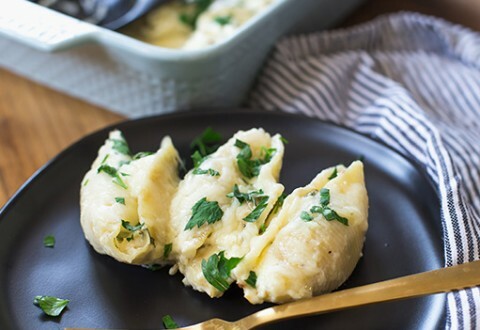 Pour remaining alfredo sauce over shells. Bake at 350 F for 30 minutes. Increase oven temperature to 400 F. Top shells with remaining mozzarella cheese and bake 10 more minutes, until cheese is melted. Serve topped with additional chopped herbs, such as parsley or basil. Enjoy!